Sundays and poetry go so well together. Traditionally, the mornings are spent in some sort of recline. Music, coffee and words to rise to is my standard pattern. Poets personal points of view are intriguing to decipher. Trapped inside cryptic puzzles to piece and unravel. You find out a lot about the poet not only through their work but through their websites and interaction on social media. You can tell J Matthew Waters is passionate about his creations. http://jdubqca.com/about/ You’ll always find him sharing his and others via Twitter and I always look forward to see what he has discovered. I often know nothing about the author till after I read their work. I find this process is fun, their life maps inside chapters help me discover where the poet comes from. I prefer clues to what has shaped them to write what they write, decipher fact from fiction that I find in lines. I discovered he is American, he gardens, has a family and seems very happy and comfortable. You read some of J’s pieces over and over, as only the Poet themselves know the truth and motivation of a poem. In between is where I make my conclusions. Reading In The Middle Of Somewhere definitely got me thinking. I enjoy his pieces on the poetic process. Once In San Antoine and Unrealistic Haiku Expectations, when beauty and meaning is found in the method, here is where we get a breath of his humour. His holiday poetry is delightful, exotic destinations experienced and imagined. You scan his view, walk in his insightful shoes. Nothing But A Vestigial Drawing reveals another passion “A thousand miles from here viewing gardens I had been meaning to plant, I sit and sketch” His love of nature blooms, Watching A Petal a wondrous reflection, “a soft, geranium petal strained to reach the four o’clock sun” Reading J Matthew Waters is a peaceful experience. Reunion and old age, time and memory, life becomes an echo, reminding us that one’s existence is a blink in a moment. Some subjects show age, spooning corks from bottle caps a little clue to era. 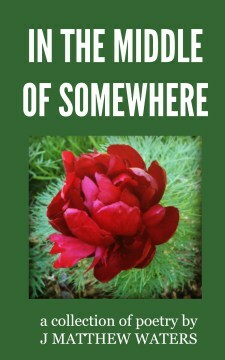 Poems about leprechauns, ancestry, drinking, love and narcolepsy. Close to my heart is Irresistible Force as “The fox in the sky wanders by day, the universe his playing field” I stretch and relax into a dappled sun having enjoyed yet another poetic devotee. Thank you so much, Abbie, for reviewing my poetry collection. It is a wonderfully artistic post. Thank you so much for your generosity.